I haven't seen ADP-themed spam for a very long time, mostly because it gets filtered into a deep dark hole that even I can't see into. Your ADP past due invoice is ready for your review at ADP Online Invoice Management . Review your ADP past due invoice here. This downloads a ZIP file invoice1211_pdf28.zip which in turn contains a malicious executable invoice1211_pdf.exe which has a VirusTotal detection rate of 6/54. • Please note that your bank account will be debited within 1 banking day for the total shown on the Summary(s). • Please don't try to reply to this message. auto informer system can't accept incoming email. Please Contact your ADP Benefits Specialist. This notification was sent to current clients in your system that approach ADP Netsecure. As always, thank you for choosing ADP as your business partner! As mentioned before, this is either the return of the infamous RU:8080 gang, or it is somebody pretending to be the gang. But one rather peculiar factor is that in this case the bad guys only seem to have a small pool of servers that have been compromised for some time, and don't seem to have added any news ones. Attached to the email is a file called ADP_831290760091.zip which in turn contains ADP_Reference_09172013.exe which has a VirusTotal detection rate of 9/48. Automated analysis    shows a connection attempt to awcoomer.com on 78.157.201.219 (UK Dedicated Servers Ltd, UK). I don't have any evidence of further infections on this server, it does host 30+ legitimate UK sites if that helps..
provided on the invoice for assistance. Thank you for choosing ADP Payroll. There is an attachment ADP_week_invoice.zip which in turn contains a malicious executable file ADP_week_invoice.exe. The payload is exactly the same as this other malicious spam run which is running in parallel. This message is to inform you of the upcoming �Phase 2� enhancement to ADP Security Management (formally ADP Netsecure). This is where you manage your users� access to ADP�s Internet services, and includes the self-service registration process. Effective August 15th, ADP Security Management will reflect a new user interface. This will include tasks such as Account Maintenance, User Maintenance, and Company Maintenance within Security Management. � View the Supported Browsers and Operating Systems, listed here. These are updated to reflect more current versions to ensure proper presentation of the updated user interface. It is important to note that the new ADP Security Management is best accessed using Microsoft Internet Explorer Version 8 or Mozilla Firefox Version 3.6, at minimum. This email was sent to active users in your company that access ADP Netsecure with a security role of �security master� or �security admin�. You may have other users that also access ADP Netsecure with other security roles. Please inform those users of these enhancements, noting that the above resources will have some functionality that does not apply to their role. As always, thank you for choosing ADP as your business partner! If you have any questions, please contact your ADP Technical Support organization. Cherry Hill Township provides a secure environment for all information concerning our residents and all other business concerns. The information contained in this email is intended only for the individual(s) addressed in the message and may contain privileged and/or confidential information that is exempt from disclosure under applicable law. Cherry Hill Township provides a secure environment for all information concerning our residents and all other business concerns. The information contained in this email is intended only for the individual(s) addressed in this message and may contain privileged and/or confidential information that is exempt from disclosure under applicable law. From there, the victim is sent to a malware site that uses a hijacked GoDaddy domain at [donotclick]hubbywifeburgers.com/topic/nearby-promptly.php hosted on 199.195.116.51 (A2 Hosting, US - report here). This IP probably contains other hijacked domains from the same owner. Yoyr payroll for check date 06/25/2013 is approved. Your payroll would be done at least 3 days before to your check date to ensure timely tax deposits and payroll delivery. If you offer direct deposit to your employees, this will also support pay down their money by the due date. Important: Please be advised that calls to and from your payroll service team may be monitored or recorded. Please do not reply to this message. auto informer system not configured to accept incoming messages. Related evil domains and IP addresses to block can be found here and here. Use this links to: Review or Decline this changes. 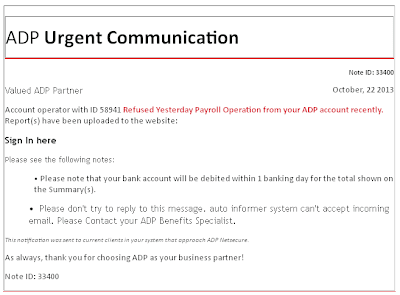 If you have not made and authorized this bank account change, please contact your ADP Service Team immediately. This security precaution is another reason why so many businesses like yours choose ADP, the world's leading payroll provider for over 60 years, to handle their payroll. This e-mail comes from an unattended mailbox. Please do not reply. Your latest ADP Dealer Services Invoice is now available to view or pay online at ADP Online Invoice Management . To protect the security of your data, you will need to enter your ID and password, then click on Access your Online Invoice Management account. If you have already sent your payment please disregard this friendly reminder and Thank you for choosing ADP. Contact David Nieto by Secure Mail. Note: This is an automated email. Please do not reply. From there the victim is directed to the main malware landing page at [donotclick]4rentconnecticut.com/news/cross_destroy-sets-separate.php on 174.140.171.233 (DirectSpace LLC, US). A look at URLquery shows many suspect URLs on this server and VirusTotal also reports several malicious URLs. • Please note that your bank account will be charged within 1 business banking day for the sum shown on the Statement(s). • Please don't try to reply to this message. automative notification system not configured to accept incoming email. Please Contact your ADP Benefits Expert. 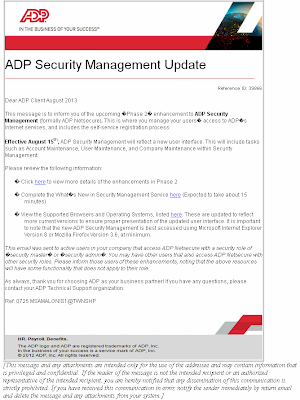 This email was sent to existing users in your company that access ADP Netsecure. 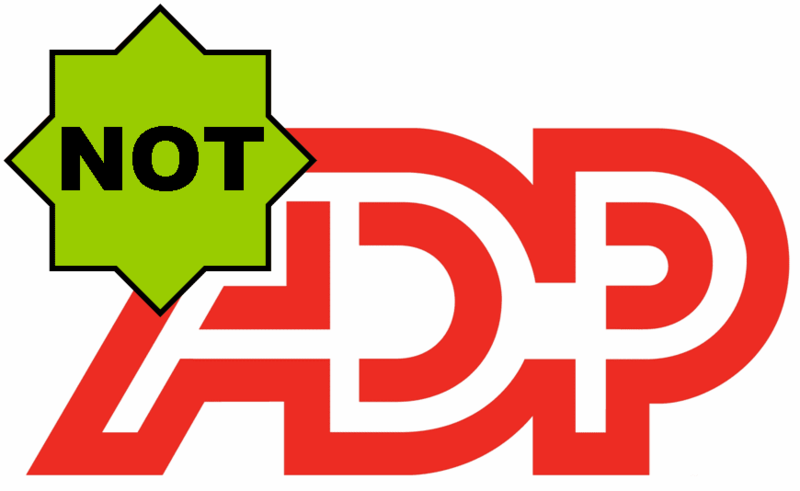 As every time, thank you for using ADP as your business affiliate! 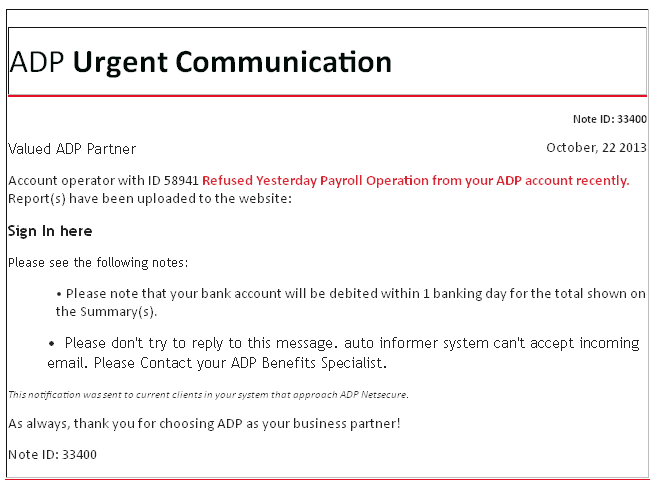 This note was sent to acting users in your system that approach ADP Netsecure. As usual, thank you for choosing ADP as your business affiliate! In the business of your success is a service mark of ADP, Inc.
© 2013 ADP, Inc. All rights reserved. The malicious landing page and recommended blocklist are the same as for this parallel attack also running today. This message is to notify you that your package has been processed and is on schedule for delivery from ADP. We will notify you via email if the status of your delivery changes. • Please note that your bank account will be debited within one banking business day for the amount(s) shown on the report(s). • Please do not respond or reply to this automated e-mail. If you have any questions or comments, please Contact your ADP Benefits Specialist. The malicious payload is meant to be [donotclick]faneroomk.ru:8080/forum/links/column.php but right at the moment it is not resolving. We can perhaps do a little digging around to see what's going on here. The WHOIS details show the notorious Russian "Private Person". Your ADP Payroll invoice for last week is attached for your review. If you have any questions regarding this invoice, please contact your ADP service team at the number provided on the invoice for assistance. In this case there was a ZIP file called 048575623_02082013.zip (this may vary) with an attachment 048575623_02082013.exe designed to look like a PDF file. These may be legitimate hacked domains, but if you are seeing unexpected traffic going to them then it could be a Zbot indicator. • Please note that your bank account will be charged-off within 1 business day for the value(s) specified on the Record(s). •Please don't reply to this message. auomatic informational system unable to accept incoming email. Please Contact your ADP Benefits Expert. 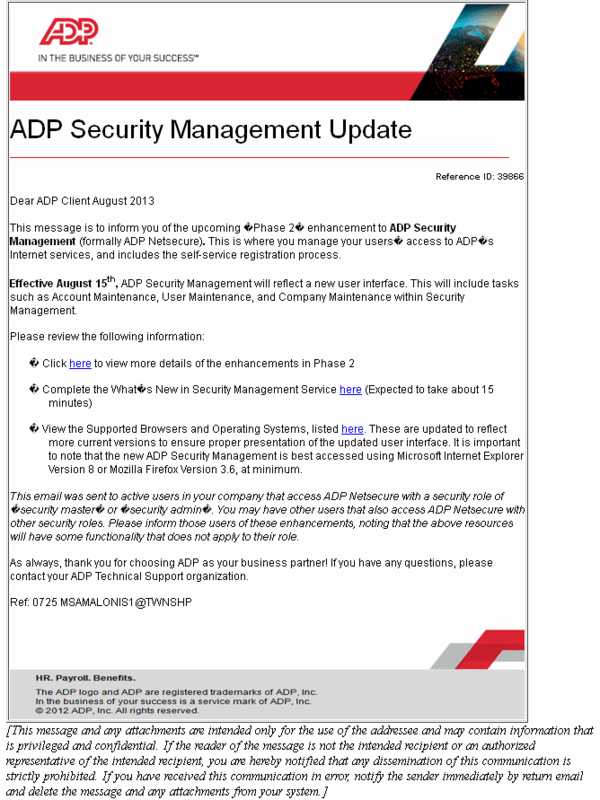 This email was sent to acting users in your company that access ADP Netsecure. This fake ADP spam leads to malware on tetraboro.net. It contains some errors, one of which is the subject line just says "adp_subj" rather than having been filled out properly. The most amusing one is the reference to "business butty" which presumably is some sort of sandwich. • Please note that your bank account will be debited within one banking day for the amount(s) specified on the Protocol(s). � Please don't reply to this message. auomatic informational system not configured to accept incoming mail. Please Contact your ADP Benefits Specialist. This notification was sent to current clients in your company that approach ADP Netsecure. As general, thank you for choosing ADP as your business butty! The malicious payload is on [donotclick]tetraboro.net/detects/coming_lost-source.php hosted on 222.238.109.66 (Hanaro Telecom, Korea). A quick look indicates a number of related malicious domains and IPs, including advertizing1.com through to advertizing9.com. All of these should be blocked.